On average, you make more than 200 decisions about food each day. However, you’re only aware of a small fraction of them. The rest are performed by your unconscious mind, and can lead to so called mindless eating. Mindless eating can make the difference between under-eating or overeating. It can also promote either easy weight loss or unexplainable weight gain. This article explores why mindless eating happens and what you can do to stop it. Behavioral scientists believe one of the main reasons people overeat is because they rely on external rather than internal cues to decide if they feel hungry or full. Naturally, this can lead you to eat more than you need to. To demonstrate this point, researchers provided participants with an unlimited amount of chicken wings while they watched the American football Super Bowl. Half of the tables were continuously cleaned while the bones were left to accumulate on the other tables. Interestingly, people with bones on their tables ate 34% less, or two fewer chicken wings, than people who had their tables cleaned. Another experiment used bottomless bowls to slowly refill some participants’ soups as they ate. Participants who ate soup served in the bottomless bowls consumed about 113 extra calories — 73% more — than those who ate from normal bowls. Interestingly, those who ate more soup didn’t feel more full. Most also estimated their calorie intake to be the same as those eating from the regular soup bowls. These two studies show that people tend to rely on visual cues, such as chicken bones or the amount of soup left, to decide whether they’re full or still hungry. To make this natural tendency work in your favor, keep evidence of what you eat in front of you. Examples include the empty beer bottles you drank at a barbecue, or the plates used for previous courses at an all-you-can-eat buffet. BOTTOM LINE:Use visual reminders of the foods you eat to help you stay mindful of how much food you’ve already consumed. Another external cue that can cause you to overeat is the size of your food packaging. In fact, eating from larger packages can lead you to mindlessly consume as much as 20–25% more calories. Researchers confirmed this tendency by providing participants with small or large packages of spaghetti, ground beef and tomato sauce. Those given the large packages prepared 23% more food than those given smaller packages. Interestingly, they also ate most of the extras, which amounted to an additional 150 calories. Another study gave participants either a half-pound (227-gram) or one-pound (455-gram) bag of M&Ms. Those given the large bags ate 66 more M&Ms — an extra 264 calories — than those eating from the smaller bags . However, packages that include pause points may help diminish this effect, since they give you time to decide if you should keep eating. For example, participants eating potato chips from cans of Pringles in which every 7th or 14th chip was dyed red ate 43–65% fewer chips than those eating from cans with no dyed chips. Similarly, people eating from a large bag of 200 M&Ms consumed 31 more candies — and 112 extra calories — than people given 10 small baggies of 20 M&Ms. BOTTOM LINE:Favoring smaller packages can help you reduce the amount of calories you consume by up to 25% without you even noticing it. Studies show that people tend to eat 92% of the food they serve themselves. Therefore, reducing the amount of food you serve yourself can make a significant difference to the amount of calories you consume. One easy way to reduce portion sizes without noticing the change is to use smaller plates and taller glasses. That’s because big plates tend to make your food portions look small, encouraging you to serve yourself larger amounts of food. Simply using 9.5-inch (24 cm) plates instead of 12.5-inch (32 cm) plates can help you easily eat up to 27% less food. Additionally, studies show that using tall, thin glasses instead of wide, short ones can reduce the amount of liquids you pour yourself by up to 57% . Therefore, pick wide, short glasses to help you drink more water and tall, thin ones to help you limit alcohol and other caloric beverages. BOTTOM LINE:Replacing large plates with smaller ones and wide, short glasses with tall, thin ones are two easy ways to reduce your portion sizes. Research shows that having a wider variety of food options can lead you to eat up to 23% more. Experts label this phenomenon “sensory-specific satiety.” The basic idea is that your senses tend to get numbed after you’re exposed to the same stimulus many times — for instance, the same flavors. Having a wide variety of flavors in the same meal can delay this natural numbing, pushing you to eat more. Simply thinking there’s more variety can also fool you. Researchers found that participants given bowls with 10 colors of M&Ms ate 43 more candies than those given bowls with 7 colors, despite all M&Ms tasting the same (11). To help sensory-specific satiety work for you, try limiting your choices. For instance, pick only two appetizers at once during cocktail parties and stick to ordering the same drinks throughout the evening. BOTTOM LINE:Reducing the variety of flavors, colors and textures you’re exposed to will help prevent you from eating more than your body needs. Researchers report that the popular saying, “out of sight, out of mind” applies particularly well to mindless eating. To illustrate this point, one study gave secretaries Hershey’s Kisses in covered bowls that were either clear, so they could see the candy, or solid, so they could not. Those given clear bowls opened them to get candy 71% more often. They consumed an extra 77 calories per day on average, compared to the other group (12). BOTTOM LINE:Keep tempting treats out of sight to prevent you from eating them mindlessly. The more work that’s required to eat a food, the less likely you are to eat it. To demonstrate this, researchers tried a new version of the Hershey’s Kisses study above. This time, all secretaries were given clear bowls of candy. The bowls were placed in three different spots around the office: on the desk, in a desk drawer or six feet (1.8 meters) away from the desk. The secretaries ate an average of 9 candies a day when the bowl was on the desk, 6 if the bowl was in the drawer and 4 if they had to walk to get to the bowl (13). When asked why they ended up eating less when the bowls were placed further away, the secretaries stated that the extra distance gave them the time to think twice about whether they really wanted the candy. Make this work for you by picking snacks that require some extra work, or by keeping less nutritious snack foods out of reach. Better yet, get in the habit of serving all foods on plates and eating only while sitting at the table. This inconvenience might be just what you need to keep yourself from mindlessly snacking out of boredom or while preparing dinner. BOTTOM LINE:Take the convenience out of eating. 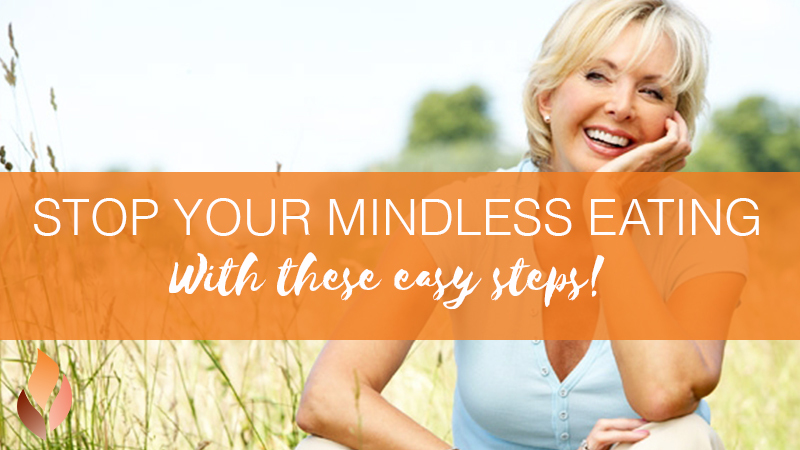 Adding extra steps will allow you to turn a mindless eating behavior into a conscious choice, reducing the chance of overindulgence. Slow eaters tend to eat less, feel more full and rate their meals as more pleasant than fast eaters. Scientists believe that taking at least 20–30 minutes to finish a meal allows more time for the body to release hormones that promote feelings of fullness . The extra time also allows the brain to realize you’ve eaten enough before you reach for that second serving. Eating with your non-dominant hand or using chopsticks instead of a fork are two easy ways to reduce your eating speed and make this tip work for you. Chewing more often can also help. Here is a detailed article about how eating more slowly can help you lose weight. BOTTOM LINE: Slowing down your eating speed is an easy way to consume fewer calories and enjoy your meal more. Eating while you’re distracted can lead you to eat faster, feel less full and mindlessly eat more. Whether this is watching TV, listening to the radio or playing a computer game, the type of distraction doesn’t seem to matter much. For instance, people watching television while eating their meals ate 36% more pizza and 71% more macaroni and cheese. And, it seems that the longer the show, the more food you’re likely to eat. One study noted that participants watching a 60-minute show ate 28% more popcorn than those watching a 30-minute show. Luckily, this effect seems to apply to nutritious foods as well as junk foods, since participants watching the longer show also ate 11% more carrots . Scientists note that longer distractions extend the amount of time spent eating, making you more likely to overeat. In addition, eating while distracted may cause you to forget how much you’ve consumed, leading to overeating later in the day. Indeed, another study noted that participants who played a computer game while eating lunch felt less full and snacked on nearly twice as many biscuits 30 minutes later, compared their non-distracted counterparts . BOTTOM LINE:Eating without using your TV, computer or smartphone may help decrease the amount of food your body needs to feel full and satisfied. Eating with just one other person can push you to eat up to 35% more than when you eat alone. Eating with a group of seven or more can further increase the amount you eat by 96% (24, 25). Scientists believe that this is especially true if you eat with family or friends, because it increases the time you spend eating, compared to when you eat by yourself. The extra table time can push you to mindlessly nibble what’s left on the plate while the rest of the group finishes their meal. It may also encourage you to order a dessert you normally wouldn’t (26). Luckily, sitting next to slow eaters or people who normally eat less than you can work in your favor, influencing you to eat less or more slowly (27). Other ways to counter this effect include choosing in advance how much of your meal you want to consume, or asking the server to remove your plate as soon as you’re done eating. BOTTOM LINE:When dining in groups, sit next to people who eat less or at a slower speed than you. This can help prevent overeating. Relying on external cues like the time of day to determine your level of hunger may lead you to overeat. A study demonstrated this idea by isolating participants in a windowless room with a clock as their only time cue. This clock was then artificially controlled to run faster. Researchers noted that those who relied on the clock to know when to eat ended up eating more often than those who relied on internal hunger signals (28). Interestingly, normal-weight participants were less likely to rely on the clock to determine whether it was time to eat (24, 28). A great tip I give clients who have difficulty distinguishing physical from mental hunger is to ask themselves whether they’d readily eat an apple. Remember, real hunger doesn’t discriminate between foods. Another telltale sign of mental hunger is a “taste” for something specific, such as a BLT sandwich. A craving for a specific food is unlikely to indicate real hunger. BOTTOM LINE:Rely on internal cues of hunger, rather than external ones, to decrease the likelihood of eating more than your body needs. Thanks to clever marketing, even foods labeled as healthy can push some of us to mindlessly overeat. Nevertheless, study participants given granola labeled as “low-fat” ended up eating 49% more granola than those provided with the normally labeled granola . Another study compared calorie intake from Subway versus McDonald’s. Those who ate at Subway consumed 34% more calories than they thought they did, while those who ate at McDonald’s ate 25% more than they thought. What’s more, researchers noted that the Subway clients tended to reward themselves for their supposedly healthy meal choice by ordering chips or cookies with their meal. This tendency to unconsciously overeat foods that are considered healthier, or compensate for them by having a side of something less healthy, is commonly known as the “health halo” . Steer clear of the effects of the “health halo” by picking items based on their ingredients rather than their health claims. Also, remember to pay attention to the side items you choose. BOTTOM LINE:Not all foods labeled as healthy actually are. Also, avoid picking less-than-healthy sides to accompany your healthy meal. Research has shown that buying in bulk and stockpiling foods can push you to eat more. A study investigated this effect by providing a group of normal-weight college students with four weeks of snacks. Some received a normal quantity of snacks, while others received double that quantity. Participants who received the double portions ate 81% more calories from snacks per week than those who received the smaller snack portions. Avoid falling for this effect by purchasing only what is necessary and trying not to buy snack foods for future events or unexpected visits. Finally, if you really must stockpile items, make sure to keep the extra items well out of eyesight. BOTTOM LINE:Stockpiling foods increases the likelihood you’ll eat them. Instead, get in the habit of buying only what is necessary for the week. Eating large volumes of food tricks your brain into thinking you ate more, helping decrease the likelihood of overeating. Researchers examined this effect by serving participants two smoothies identical in calories. However, one had air added to it. Those who drank the greater-volume smoothie felt fuller and ate 12% less at their next meal. An easy way to add volume to your meals without increasing the calorie content is to pick high-fiber foods with a low energy density, such as vegetables. That’s because extra fiber and water add volume, which stretches the stomach and helps you feel more full. Fiber also helps slow down the emptying rate of the stomach and can even stimulate the release of hormones that make you feel satisfied). A good rule of thumb to maximize food volume is to fill at least half of your plate with vegetables at each meal. BOTTOM LINE:High-volume foods help you feel full and decrease food intake at the next meal. Eating fiber-rich foods is an easy way to do this. These simple tips to reduce mindless eating should help you lose weight over time, in a way that feels easy and can be maintained over the long term. For the best results, choose just three of these tips and aim to apply them consistently for around 66 days — the average time it takes to create a habit. Finally, to learn more about mindless eating, I strongly suggest reading the book Mindless Eating: Why We Eat More Than We Think, by Brian Wansink, Ph.D.